Blue Mo-fi review | What Hi-Fi? These Mo-Fis are like nothing we’ve seen before. Their unique structure looks more suited to a car part than a pair of headphones, so it’s no surprise to learn that the design was inspired by a Formula One car. Instead of a conventional headband with an extending slider for adjustment, the elongated ear cups tilt, extend and pivot on hinges to fit even the longest or widest noggin. The cups drop down completely, making them ideal for hanging around your neck. Their metal anatomy might not look comfortable, but there’s good cushioning where it counts. The thick pads hug your ears, providing good isolation too. The thick strip of pleather underneath the narrow headband is there to protect the top of your head, but it can’t quite stifle the burden of the 466g structure – you won’t forget these are on your head in a hurry. 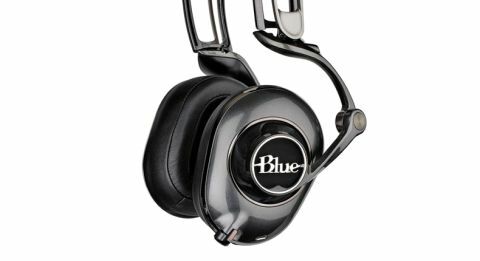 But the real talking point is the Blues’ built-in amp that, like with active speakers, powers their drivers. The idea is to improve the sound out of a smartphone or portable device whilst eliminating the need for an external headphone amp. Three settings can be activated via a small switch on the left ear cup: ‘On’ kicks the amp into gear, while ‘On+’ adds more low-end support. To use either, the amp must be charged via the supplied mini-USB cable – a three to four hour charge supposedly gives 12 hours of playback. Lastly, ‘Off’ is for passive listening when the battery runs out. You have to hand it to Blue: the US-based microphone company has entered a crowded field with something different. But for the money, the Mo-Fis need to sound seriously good – and sadly, they don’t. Switch to ‘On’ (remember to turn your source down first to avoid ear-splitting volume) and the Blues sound as tenacious as they look. Plugged into a smartphone, there’s power and volume in spades. The meaty bassline in the Ying Yang Twins’ Dangerous thunders through the Mo-Fis, which deliver the upbeat track with real fire in their belly. There’s decent weight too and every note is crystal clear. But it’s all downhill from here. There’s not much in the way of control, precision or timing, and the direct delivery lacks space and insight. The upshot is a blunt, messy sound almost to the extent of crudeness. While their character is a good match for lively tracks, they charge through even the mellowest classical pieces like a bull in a china shop. There’s not even a glimpse of patience or discipline, not to mention dynamic scrutiny. We find the overpowering bass a little distracting too – and even more so with ‘On+’ activated. The amp is part of the problem and we actually prefer their sound in passive mode. There’s more dynamics and subtlety up for grabs, but even then it’s nowhere near the level of the class leaders at this price, such as the Sennheiser Momentum 2.0s. The concept and design of the Mo-Fis capture our attention, but poor sound loses it just like that. For £280, they need to be much better.